CCE Forum on site science. Discussions focused on some of CCE's principal contributions, in preparation for the LTER 40-year review and the CCE mid-term site review. Institut Universitaire Européen de la Mer, Plouzané, France. Presentation by Mark Ohman about the CCE site and opportunities for collaborative research. ASLO 2019 Aquatic Science Meeting, San Juan, Puerto Rico. CCE science was represented by numerous participants. Laboratoire Océanologique de Villefranche-sur-mer and Mediterranean Institute of Oceanography, France. Mark Ohman gave presentations about the CCE site and opportunities for collaborative research. CCE Forum on Data Sustainability Discussions focused on our priorities for sustained time series measurements. Collection of five CCE-LTER research articles published in Deep-Sea Research, volume 140, on the response of the southern CA Current Ecosystem to the Warm Anomaly and El Nino, 2014-2016. LTER All Scientist's Meeting, Asilomar Conference Grounds, Pacific Grove CA. Numerous participants from CCE, including PI's, Information Manager, Education and Outreach Manager, and graduate students. CCE Forum on regional subdivisions, SIO. Local and remote CCE participants discussed the most appropriate ways to subdivide the CCE/CalCOFI domain, for data averaging for time series calculations. EOS Research Spotlight on Phaeodarians. A paper led by CCE postdoc Tristan Biard concerning the role of single-celled phaedorians in the silica cycle is featured in the latest EOS (https://eos.org/research-spotlights/the-tiny-organisms-that-transport-silica-across-earths-oceans). CCE Forum on Cross-shore fluxes, SIO. Local and remote participants in CCE discussed some very stimulating results from the P1706 process cruise. This also served as the CCE Annual Meeting. LTER Science Council Meeting, hosted by NTL in Madison. Lihini Aluwihare, Kathy Barbeau, and Mark Ohman represented CCE. 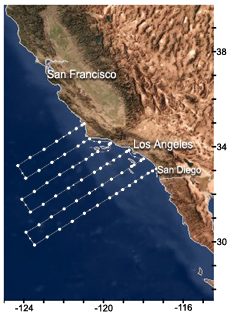 The California Current System is a coastal upwelling biome, as found along the eastern margins of all major ocean basins. These are among the most productive ecosystems in the world ocean. The California Current Ecosystem LTER (32.9°, -120.3°) is investigating nonlinear transitions in the California Current coastal pelagic ecosystem, with particular attention to long-term forcing by a secular warming trend, the Pacific Decadal Oscillation, and El Niño in altering the structure and dynamics of the pelagic ecosystem. The California Current sustains active fisheries for a variety of finfish and marine invertebrates, modulates weather patterns and the hydrologic cycle of much of the western United States, and plays a vital role in the economy of myriad coastal communities. Applications are currently being accepted. View information here.